In late 2006 and early 2007, Pipe Line Company (PL) constructed a new, approximately two-mile long, 12-inch diameter crude oil pipeline segment in the unincorporated area east of Martinez, California. This new segment interconnects PL’s existing Kettleman to Los Medanos (KLM) pipeline to the south end of an existing Valero 20-inch diameter pipeline. The capacity of the new pipeline segment is 55,000 to 70,000 barrels per day (BPD). The project also included pig launching and receiving facilities, custody transfer metering, stationary meter prover, electrical power connections to PG&E, leak detection, and over-pressure protection. EDM Services provided engineering, design and environmental support to the Valero project teams. The project posed a couple of technical changes. First, the southern portion of the project was underlain by approximately 40 to 70-feet of uncompressed peat soils; these soils were expected to settle five to six feet during the first few years of operation. Second, the pipeline required a bored crossing beneath the 680 Freeway through very difficult soil conditions. 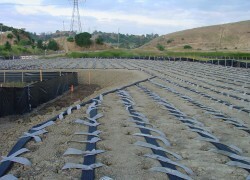 To overcome the anticipated five to six feet of anticipated settlement at the southern end of the project, a wick drain system was installed. Nilex Corporation, under subcontract to EDM Services installed nearly 7,000 wick drains to an average depth of 50-feet; the wick drains provided a path for the water being “squeezed” from the soil. At the ground surface, the wick drains were connected with almost 10,000 feet of horizontal drains. The horizontal drains were designed to collect water from the wick drains. After the wick drains were installed, several feet of surcharge soil were placed over the area. After roughly two months, the soil settlement had slowed appreciably and the surcharge soil was removed. The permanent facilities were constructed on poured in place, steel encased reinforced concrete piers. These deep foundations extended to a depth of 70-feet below the ground surface. Moment resisting connections were used between the pipes and pile cap to minimize seismic induced lateral motion. The construction contractor, ARB, Inc., elected to install a 16-inch casing beneath the 680 Freeway using the hammer bore technique. However, after reaching the mid-way point in the installation, very hard soil conditions were encountered. These conditions slowed the installation progress considerably. To speed construction, a larger hammer was mobilized. Although this improved construction progress, the production rates again began to fall as even harder soils were encountered. Once again, the use of a larger hammer was implemented. However, as production again began to fall, the project team decided to remove the 16-inch diameter, 0.500-inch wall thickness casing and investigate. When the casing pipe was removed, the team discovered that the casing had broken roughly half-way beneath the freeway; the hammer bore had been literally pushing the pipe string through the stuck casing, splitting the half-inch thick steel pipe laterally. In order to retrieve the broken casing from beneath the freeway, the project team elected to use a 30-inch diameter tunnel. After obtaining the necessary permits from CALTRANS and OSHA, the tunneling work was begun. Once the end of the broken 16-inch casing was encountered, it had to be cut out of the way in small pieces. Naturally, forced air breathing apparatus and forced air ventilation were required to insure a safe working environment for the workers; the working environment was also continuously monitored during all shifts.